NOTES: Short Run with pewter detail parts. The Avro 504, which was built in greater numbers than any other single British aircraft type during the Great War with a total of 8,340 built by the parent company and contractors, is one of the true “greats” of aviation. Alliot Verdon Roe was one of the great British aviation pioneers. His AVRO 504, which was first flown at Brooklands in July 1913, was the foundation stone of the later success of the A.V. Roe Company, which would include such immortals as the Lancaster and Vulcan bombers. The aircraft was immediately ordered by both the Royal Flying Corps and the Royal Naval Air Service for use in the reconnaissance role. An Avro 504A 5 Squadron, R.F.C., was the first British aircraft brought down by enemy fire. R.N.A.S. Avro504s were used in the first long-distance air raid of the war, an attack on the Zeppelin sheds at Friedrichshafen, led by Squadron Commander E.F. Briggs. By 1915, the Avro 504 was only used in combat operations in secondary fronts like the Middle East, and the airplane found its true calling as a trainer, with 4,800 employed in this role in the U.K. during the course of the war. The Avro 504J and 504K were the most successful versions of this ubiquitous airplane, since they introduced a revolutionary universal engine mount; the 504K was able to use any available rotary engine. After the war, the 504K remained in service with the RAF as its principal trainer until the late 1920s, when it was retired to the newly-created Royal Auxiliary Air Force, where it remained in service until 1935. Avro 504Ks served after the Great War with the air forces of the United States, Portugal, Denmark, Argentina, Estonia, Peru, New Zealand, Japan, Australia, Canada, Finland, Mexico, South Africa, Sweden, Norway and the USSR. With demobilization, huge numbers of Avro504s were declared surplus and placed for sale. In 1919, an Avro 504K without engine sold for 868 Pounds, with the price dropping a year later for one with an engine for 650 Pounds. The Avro 504 was to Great Britain what the Jenny was to the United States in creating air mindedness in the 1920s, with Aerial Derbies and Air Traffic Exhibitions expanding throughout the country during the post-war years. Local flying clubs thrived with the airplane, and barnstormers like Alan Cobham became well-known. Several Avro 504Ks still fly - yours truly had a ride in one at the Watsonville West Coast Antique Fly-In 30 years ago. In the U.K. visitors to the Shuttleworth Collection can see their well-known Avro 504K H5199 flying on late summer afternoons. 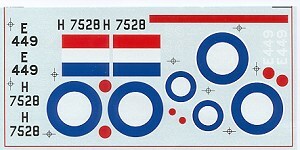 The only previous kit of the Avro 504 in 1/48 scale is one originally produced by Merit some 40-odd years ago that has been re-released over the years by SMER. With this new kit from Blue Max, the SMER kit should now be seen as no more than a possible source for decals in the latest release, and for the interplane and cabane struts if the modeler doesn’t want to use the Contrail strut material provided in the Blue Max kit. While the SMER kit can be turned into a nice model with a lot of effort , it is viable only if price is the sole criteria for purchasing a model, as the Blue Max kit is thoroughly accurate in comparison. 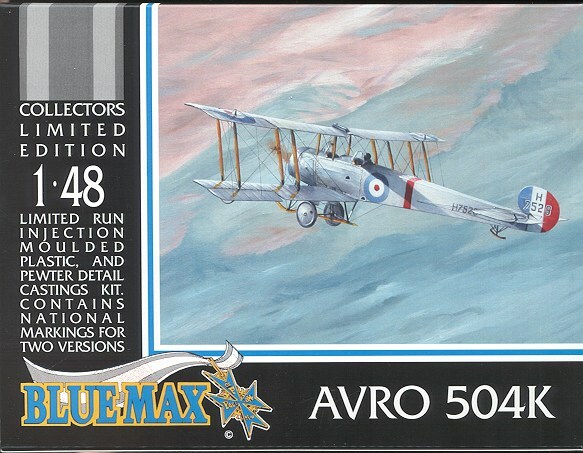 Blue Max does kits of aircraft from the First World War that are unlikely to be done by other manufacturers (though Roden now does both the S.E.5a and Bristol Fighter, which were aircraft for which Blue Max was the first to do accurate 1/48 scale models five years ago). The kits are “limited run” in the way that term used to mean in the early days of “limited run” kits, with plastic parts produced by low-pressure injection molding, and pewter detail parts. The kits are made for the experienced modeler who has accurate research material at hand and is willing to see the kit as the basis for a model that will be created with a liberal application of modeling ability. That said, the end result is - in my experience - always worth the effort. 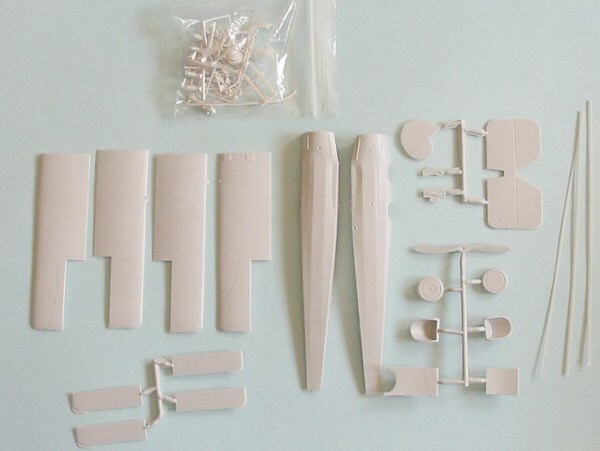 This kit provides the airframe in injection plastic with very good surface detailing. Due to the low-pressure molding process, there is flash, and the mold gates are thick enough they need to be cut off with a razor saw. Cleaning up the parts reveals that they are well-done and fit easily. The landing gear and interior detail is all provided in white metal. With the addition of seatbelts and extra detail that can be seen through the large cockpit openings, this looks to provide the basis of an accurate model that will be far superior to the sad old Merit kit now released by SMER. Decals are provided for the Avro 504 on display at the RAF Museum, Hendon, in clear-doped linen and P.C.10, and for an RAF trainer in overall silver dope from the 1920s. I’ve always liked the Avro 504, particularly since it is one of two real World War I airplanes I have ever flown in. For those who like World War I airplanes and have the skill necessary to tackle a difficult subject, this will make a great addition to your collection.